Posted in New Novel, RSI, Writing goals & milestones, Writing life. I didn’t do NaNo this year, but I’ve tried it in years past. I hate that goddamn line. It was put in in about 2010? I think? Before that it was just a bar graph. I have never been able to keep myself above that line, which usually leads to me quitting in frustration in week 2. 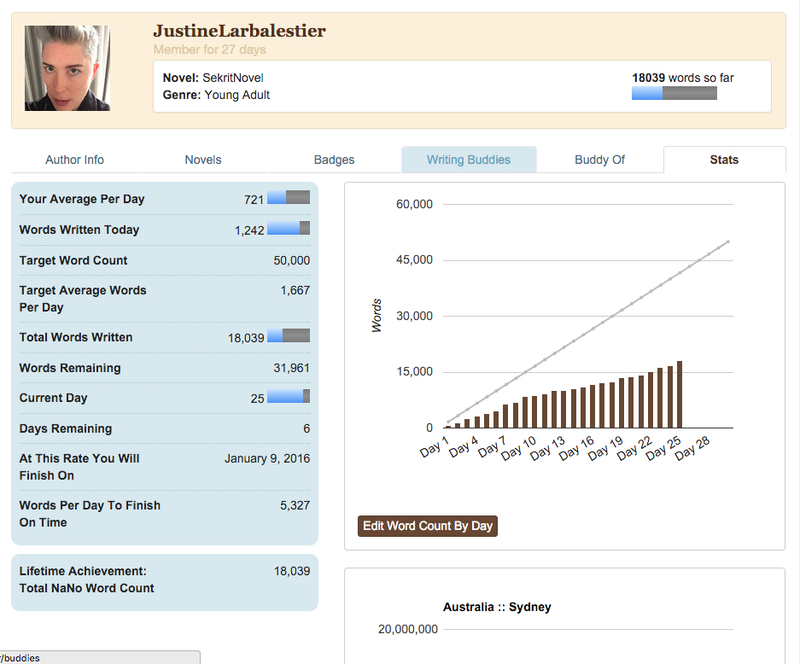 Only once have I kept up for the whole month, and I still started November 30 11k behind target (I was 13 WORDS off 50k by that midnight, I have no idea how). Ohhh it’s really interesting to see how others see nano. Congrats on getting an average of 700! That’s a really neat. I love it and I’m highly competitive too so I always race well ahead because I just need to get it all down and I’m a pretty immersive creature, but there is a smaller version of NaNo that happens in April and July(I think) called Camp NaNoWriMo where you can actually edit your word count up until validation week and it sets you up in cabins with other writer’s who are doing similar genres to yours unless you make a cabin yourself and you get to talk to them in a chat like room. It’s pretty cool. That sounds like a fantastic idea for writers on their own. And for slower writers. I like the emphasis on editing. I think if someone updates their wordcount after validating, you should be able to see their wordcount and the winner badge, both, on the forums and when you click on the profile. I went around the forum and the only places other than “writing buddies” where I couldn’t see them were the main forums where the moderators’ pics went. In the discussions, the wordcounts were visible. So I guess it’s just that one page that could use tweaking. I was talking specifically about looking at my list of writing buddies. I could only see WINNER and not what their word count was. Basically I wanted their word counts to be visible without any additional clicking. You two wrote 80k in a month?! Wow. That’s HUGE. Congrats! The quickest I’ve ever written a first draft was three months and that was more than ten years ago. Don’t think I’ll ever write that fast again. Then, of course, it was many months of rewriting before it was finished finished. It was really interesting to read this. I’ve been meaning to do a similar post about what I learnt from doing NaNo. I’ve started a few times, but this was the first year I got to 50k. The main reason for that was the support in the forums and chat rooms associated with my area. The competitive word wars, the sprints on twitter, etc, and the encouragement of others to just keep going, don’t worry if the words weren’t good (and they weren’t – there’s some terrible writing in there), just write and worry about it later. That really got me past the idea that every sentence and paragraph had to be perfect, which is what had paralysed me when trying to write in the past. I’ve been hearing exactly this from a lot of people: that Nano’s super helpful if you’ve never been able to let go and just write before, that it can really help you relax and just write without worrying about each word being perfect. So glad it worked for you! Finding a community can be essential. It was such a different experience from the creative writing course I did, where the focus was on crafting every word. It was very hard to let go of that, but very freeing when I managed it.